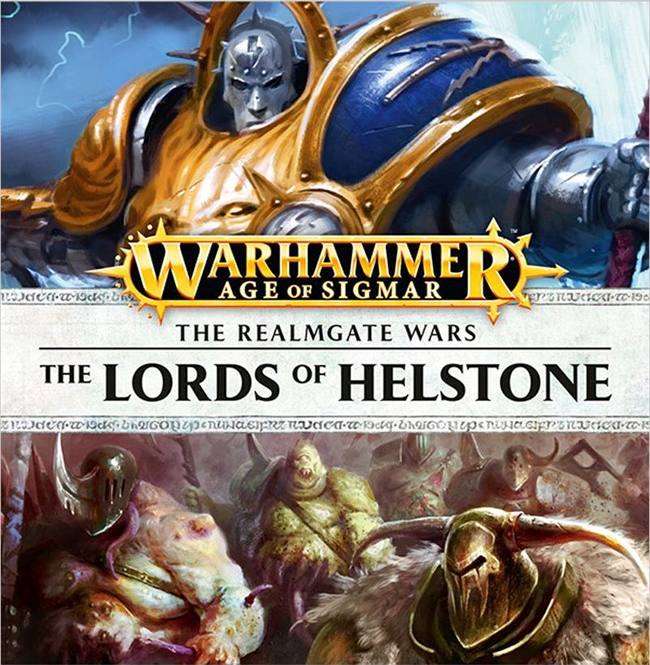 The first Age of Sigmar audio series continues with its third installment, The Lord of Helstone. The first two audio dramas dealing with Lord-Celestant Taursus' search for Nagash in the Realm of Death were great, so how does the second to last one fare? 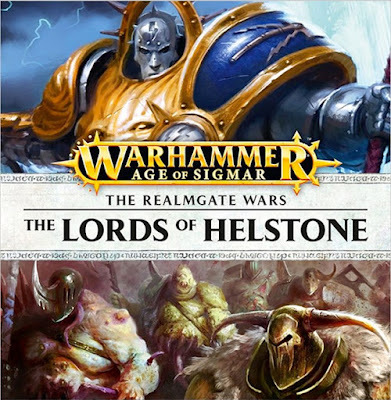 The Lords of Helstone opens up the same way as its predecessors, with a monologue by the Lord of Death himself, Nagash. Josh Reynolds really has such a good grasp on the death characters that I really hope they continue to let him handle all of them going forward. At this point Nagash is getting pretty upset about good old Sigmar stealing a bunch of souls from his grasp to make the Stormcast. The monologue covers a lot of the same ground as the last one, but this time he seems a little more aware of what the Stormcast are. It's really making me interested in seeing what happens once he finally confronts them, which I'm assuming will happen in the fourth and final audio drama. Once again the acting is spot on and the ambient music really sets the mood. I stand by my previous reviews in saying that these parts are some of the best. Once we get into the actual story we find Taursus and his Stormhost once again in battle. This time they are fighting off an ambushing party of Beastmen near the ruined city of Helstone. I really don't know why people keep saying that the Beastmen are going to get canned. They have been in almost every single story so far in one way or another. Once the herd was forced to retreat Taursus and Mannfred get to explore the ruins of the ancient city. Helstone sounds really interesting and again paints a super imaginative picture of what life in the Realms were like before Chaos ruined them. It was a city with 99 stories, stretching up into the clouds and down below the earth into the bedrock. When our heroes find it all that is left above ground are ruins and a giant crater. Below ground though the ruins are still intact, and it's down there that Mannfred tells them they must go. We learn that the vampire has been searching for an artifact that will help reveal the location of one of the gates to the underworld. After a pretty interesting history lesson on what befell the city during the Age of Chaos, he reveals that it's located somewhere within the ruins. Not to worry though, because the lords of Helstone still live here, or so he claims. Taursus seems to have a connection to the city that he can't quite explain. At this point we know that in his mortal life he lived in Shyish, and now it seems like Helstone may have been where he made his last stand. As they travel down into the bowels of the city the lords of Helstone are encountered in all of their glory, decrepit ghouls who make the ruins their home. Without giving to much more away I can say that the Stormcast also run into the other denizens of Helstone, a warband of Nurgle. This is where the majority of the action happens as they battle their way through the Blightkings and Beastmen. I have to say that the battles in this are pretty gripping and kept my attention the whole time. Sometime battles can become background noise, but Josh made sure to keep the environments interesting and sprinkled plenty of key moments throughout. Let's just say that fighting amongst crumbling towers can be quite perilous. This installment is mostly action with a few character moments to move the plot forward. It was entertaining the whole time, but I would have to say this is the weakest of the series so far, especially compared to Sands of Blood. I feel like there could have been more strong character development, since most of it revolved around Taursus rediscovering small patches of his past life. We also get to see Mannfred and his relationship evolve more. When you couple their interactions from this one with the last one you get a more complete picture and it leaves me really interested in how it's all going to end. There is, of course, the obvious ending considering Mannfred's past history, but I hope we are treated to something at least a little different. All of the acting is once again great, with fantastic music and sound effects. You have to think of this as part three of four instead of it's own stand alone piece. Although it works fine on it's own, it works even better as part of the whole, since then you can see it as the action set piece of the series. Now bring on the final chapter, The Bridge of Seven Sorrows. Depending on how this all ends I would definitely like to see this set of characters continue on beyond these four stories. Taursus, Ramus, and Mannfred are some of my favorite AoS characters out there so far, even more so when the three of them are together. Did I mention I have listened to this three times so far? To be fair, the last time was to refresh my memory for this review, but it's a great listen. I'm planning on listening to all four of them in order once the whole set is out, probably over the span of a week or more. It makes my commutes much more interesting and action packed.